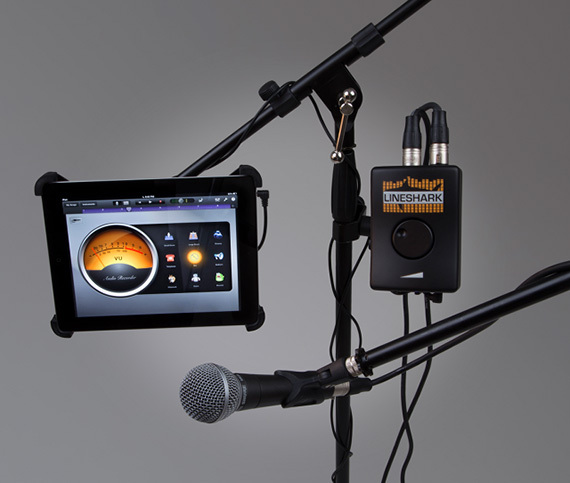 The mobile device, really the iPad and iPhone, have brought out a host of amazing tools for musicians. Anything from new effects, to amplifier simulators, to recording programs, editing programs and did I mention the 1000s of effects available for mobile devices? Rack and pedal gear that would cost tens of thousands of dollars has started to appear in the iTunes app store and even the Google Play store for literally pennies on the dollar. This holds true for guitar players, keyboar players, drummers, singers and even djs and producers. In fact Akai’s MPC app for ipad does just about everything an MPC 2500 did 10 years ago for maybe $20. Forget expensive tube amps, retro pedal effects, and extra drum kits. It’s all possible now with mobile apps. Now all of these apps are fantastic in the bedroom, the home studio or even a regular studio but what about when you’re playing live? Sure there are a couple of ways to jury-rig a set up putting your iPad in line with your house mixer or amp but those methods typically use a combination of spliced cords and redirects that come with a great hum or buzz. One forgotten cord and not enough time to find a Radio Shack and your awesome set with your iPad effect is gone. Not anymore thanks to LineShark. Lineshark is an amazing new i/o device designed to let you use your iPad, iPhone or Android device with your performance rig. It’s designed with two main functions in mind. 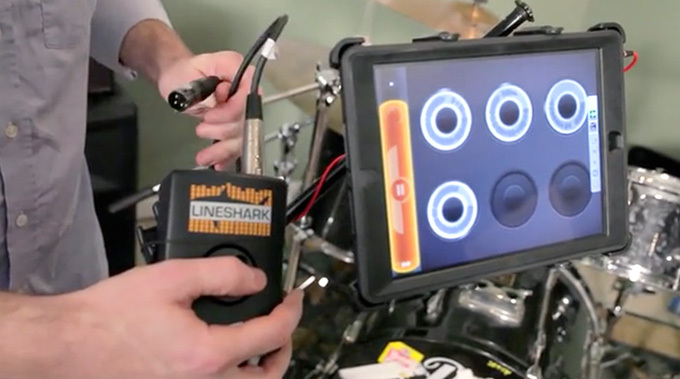 You can use the Lineshark to record your set with any number of recording apps or you can use the LineShark as an effects loop allowing you to put your instrument, keyboard, electronic drum set or microphone into the Lineshark and come back out of the Lineshark, passing through your app, before going to an amp or mixer. Yes, this is the exact device you’ve been dreaming about, sketching in your spare time or visiting Guitar Center for on a monthly basis just to find out it’s not available. LineShark has all the inputs and outputs you need plus a master gain to help level out all of your smooth sounds. Couple the Lineshark with your iPad and a Flote tablet stand and you’re in business, using your mobile device on stages everywhere. The Lineshark is no bigger than a guitar pedal and fits in your coat pocket, gig bag or with the rest of your gear. You can preorder one right this second here at Kickstarter.